We conducted interviews and usability tests with over 30 parents to uncover issues they were currently experiencing on the feed. The following two personas surfaced. 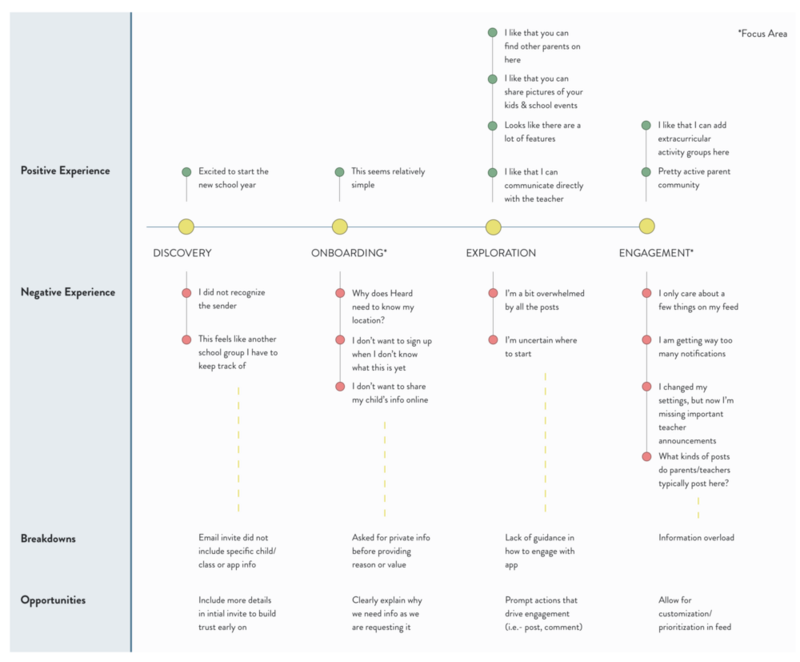 I created a visualization of the customer journey as they used the app. This helped our team pinpoint the biggest areas of opportunity to impact their experience. We addressed these with three updates. I conducted card sorts with parents to categorize posts seen on the feed. I then sketched the information architecture to visualize how the post features are nested (i.e.- photos are usually nested within a larger category like events). 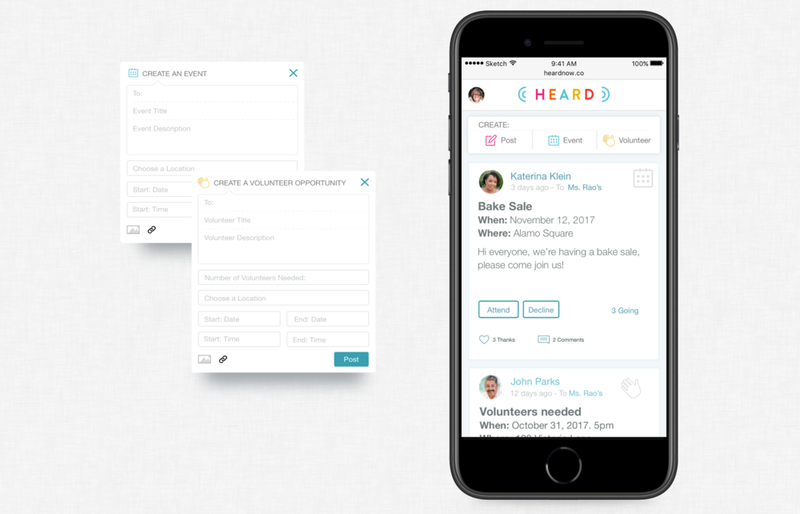 Validated through additional interviews, I surfaced that outside of general posts, events and request for volunteers were the two most commonly used categories on the platform. After testing a few different prototypes, we ultimately landed on the design below. This screen breaks out the 'create a post' experience and includes icons to indicate content categories for quick scanning. We used colors and icon to highlight urgent news on the feed. Parents and teachers would be able to announce urgent news through creating alerts. I added an additional screen reminding them of community guidelines, so alerts would be used appropriately. Previously, parents could only select notification frequency by group. However, testing revealed that parents prioritized teacher posts over other parent posts. We updated the settings page to allow parents to select frequency by group and poster. In our validation testing, we found that parents felt a decrease in information overload. This allowed parents to feel encouraged to stay up to date, rather than feeling like it is a cumbersome task. 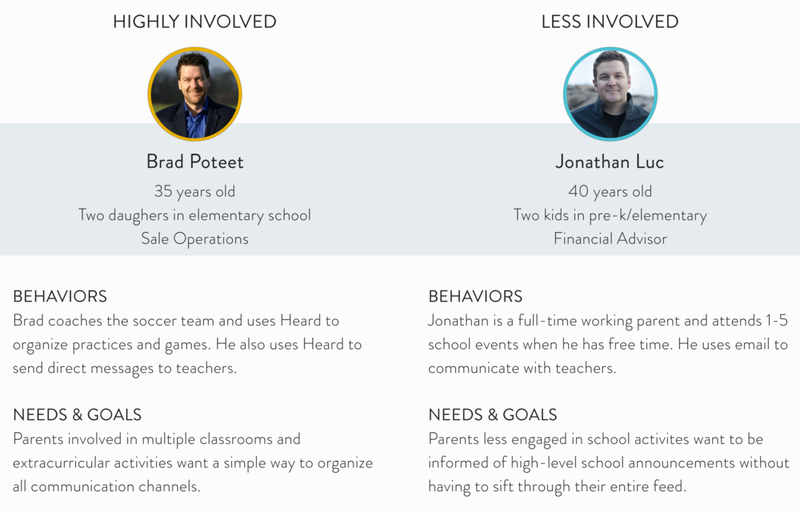 Pulling the most used activities (events and requests for volunteers) into a higher hierarchy on the feed allowed parents to complete their actions in fewer steps. The use of icons on the feed allowed for quick scanning and the updated settings gave parents more customized control.